Special, is a new series about a gay man, Ryan with mild cerebral palsy who decides to rewrite his identity and finally go after the life he wants. After years of dead-end internships, working in his pajamas as a blogger and communicating mostly via text, Ryan eventually figured out how to take his life from bleak to chic and began limping towards adulthood. 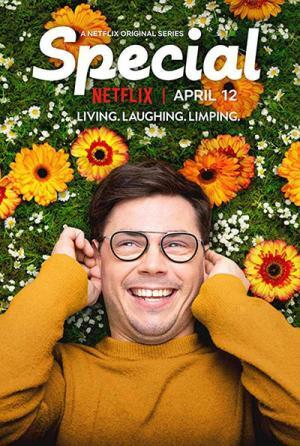 The offbeat comedy is based on series creator and star Ryan O’Connell’s memoir, “I’m Special: And Other Lies We Tell Ourselves.” O’Connell also serves as executive producer alongside Jim Parsons. Release date: April 12th, Netflix. "In the ways that truly count, 'Special' tackles timeless issues with equal parts compassion and wit." "The best and worst thing about Netflix's new comedy series 'Special' is that it's short (...) It feels more like a web series than a TV show (...) And content-wise, it feels like a web series, too, in its low-stakes amateurishness"
"'Special' is still experimenting with its tone and format, but it's doing so with a solid sense of its voice and themes, and with welcome restraint"
"[It] lives up to its name (...) Each episode runs about 15 minutes, so it feels absolutely, unsparingly lean, pared down to the point that every single scene is there because it’s proven its worth and necessity"